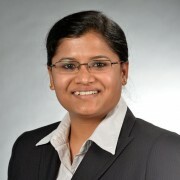 Dr. Lakshmidevi Sreeramareddy, is an Assistant Professor at Salem State University in Computer Science Department. She is teaching various IT/CS related course. She is collaborating with her colleagues in developing IT Major with ABET accreditation guidelines. Previously she was an Adjunct Faculty at McDaniel College, Westminster, MD and at Towson University, Towson, MD in Computer Science department. She has earned her Doctoral degree in Information Technology at Towson University, MD, USA in Dec 2014. Her research focuses on human computer interaction, usability, accessibility and security. She has developed gesture-based password authentication method and has conducted a series of user studies to evaluate the method. She has authored/co-authored five publications based on her research. She has extensive teaching experience, hands on system administration experience, and programming experience in standalone and web applications. She has great passion for teaching and collaborative research. 1. Sreeramareddy, L., Mulbah, P., and Feng, J. (2015). “Evaluating the Use of Gesture-Based Passwords by the Seniors”. The 17th International Conference on Human-Computer Interaction (HCI), Los Angeles, CA. 2. Sreeramareddy, L., Miao, S., and Feng, J. (2014). “Investigating Gesture-based Password: Usability and Vulnerability to Shoulder-Surfing Attacks”. The Processing of 2014 Conference on Research in Adaptive and Convergent Systems (RACS), Towson, MD. 3. Sreeramareddy, L., Janprasert, A., and Feng, J. (2014). "Evaluating Gesture-Based Password and Impact of Input Devices". The 13th International Conference on Security and Management (SAM), Las Vegas, NV. 4. Sreeramareddy, L., Feng, J. H., & Sears, A. (2012).”Preliminary Investigation of Gesture- Based Password: Integrating Additional User Behavioral Features". The 18th Symposium on Usable Privacy and Security (SOUPS), 2, Washington, DC. 5. Ma, Y., Feng, J., Kumin, L., Lazar, J., and Sreeramareddy, L. (2012). "Investigating Authentication Methods Used by Individuals with Down Syndrome". Proceedings of the 14th International ACM SIG Access Conference on Accessible Computing (ASSETS), Boulder, CO.